The room and the restaurants were elegant. It is a downtown landmark in a beautiful (but tourist) village, convenient to everything but the lake. The service from the front desk to the ballroom staff was impeccable. I was here for a conference and they saw to its success in every way possible. Seeing your five-star rating is a great way to end the day! We are delighted that you found our restaurant to be elegant and are pleased that you enjoyed our great staff! It was an unbelievable pleasure to accommodate you during your recent conference, and we look forward to seeing you again! We had a wonderful stay at this hotel. The bathrooms were small and the rooms were also, but we understood that it was the architecture of the building. Newly remodeled and very clean. It has the old feel, but yet modernization has been done. It was mud season in Saranac/Lake Placid and we had fun making fun of that and finding things to do outside of the "normal" tourist stuff. The hotel staff was help with this. Our friendly team is always happy to make recommendations for things to do in the area and we're happy that they helped ensure you had a memorable stay. We appreciate you taking the time to share your feedback with us and we're so glad that you enjoyed visiting during mud season! Seeing your familiar face on a future stay would be an honor! My second stay at the Hotel Saranac was even better than my first stay seven months ago. This hotel offers that Adirondack feel of old while offering present day modern amenities that will pamper you. It was lovely to have you as our guest again at Hotel Saranac, Curio Collection by Hilton. We're so pleased that our modern amenities, yet classic atmosphere, continue to bring you joy during your visits. Thank you for taking the time to leave us a five-star review, and we invite you to join us again. Congratulations on saving a classic property . Enjoyed our stay. Beautifully restored interiors complimented by contemporary furnishings. Attention to detail. Staff very friendly and engaged. Definite stop for those interested in a classy property. We're thrilled that our classic touches, rich history, and friendly service made for a memorable stay with us at Hotel Saranac, Curio Collection by Hilton. It was an honor to have you as our guest, and we look forward to welcoming you back at a later time. Thank you for leaving a review! 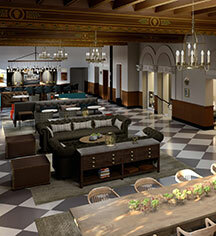 The restoration of the Hotel Saranac was fantastic. The hotel is beautiful and the rooms are comfortable. Dining in the restaurant while looking out on Main St through the large windows as the snow was falling provided an incredible scene. I can only imagine what it would look like on a bright sunny day. Anyone visiting the area should strongly consider staying here. Thank you for the wonderful review! We're thrilled our beautiful restorations impressed you and that the lovely view from our restaurant helped make your visit special. 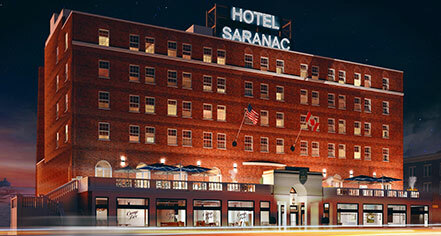 The next time you're in the area, we'd be honored to host you again at Hotel Saranac!